- Description: As per Drawing or our STD. 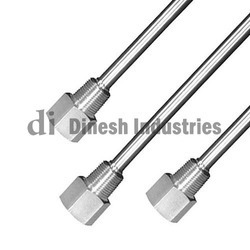 FlagedvThermowells, Threaded Thermowells & Fabricated Thermowells manufacturer in India. Material: SS304,SS316, SS316L,SS321,INCONEL600/800,601 Hastelloy, Monel, Titanium etc. A flanged thermowell is a thermowell that has a flange collar which is attached to a mating flange. T/W Process Connection: Available in BSP, NPT, Inches, Metric etc. T/W Material: SS 304 / SS 316 / SS 310 / HRS 446 / Inconel etc. Certified manufacturer of Thermowell Metal parts or Thermocouple Metal Parts Instrumentation Fittings as per Print. We are engaged in manufacturing and supplying of Thermowells to our valuable clients. SS304, SS316, SS316L, SS321, SS310, HRS446, INCONEL 600/800, 601 Hastalloy, Monel, Titanium etc.